Gelair™ Fogging Solution is specifically designed for use against extensive mold or bacteria infestation that requires control through rapid and effective treatment. Once activated through a Cold Fogging Machine, the vapour of Gelair™ Fogging disperses rapidly into hard to reach zones killing mold and bacteria. It can also be applied inside air conditioning systems to control mold within ductwork. Gelair can supply a fogging machine which has been specifically modified for the properties of a Pure Tea Tree Oil based solution. 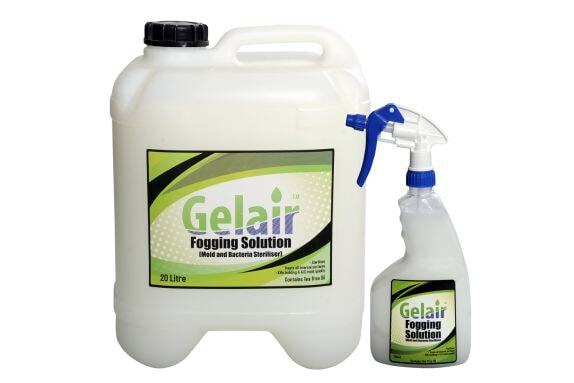 Gelair™ Fogging Solution is available in two different size options, a 750ml trigger spray bottle or 20 litre refill drums. Gelair™ delivers the benefits of Pure Australian Tea Tree Oil to improve your indoor air quality and environment using a range of healthy living technology.